<p style="margin-top: 0; margin-bottom: 7px;">Summer. The time when we try to break away from our usual grind. We take vacations, spend more time outdoors, and do our best to unwind. These activities often include the company of a good book (or two). As a young prosecutor, I was fascinated with the evidence seminars by <a href="http://www.nytimes.com/1988/03/15/obituaries/irving-younger-lawyer-55-dies-judge-law-professor-and-author.html">Judge Irving Younger</a>. His ability to take a complex topic and make it simple, understandable, and entertaining remains with me years and years later. <a href="https://www.youtube.com/watch?v=ONwjWJTfYpk">Some of his lectures are still available on YouTube</a>. </p><p style="margin-top: 0; margin-bottom: 10px;"><strong>What are some of the pet peeves you have when speaking? How do you manage them?</strong> <br />When I’m one of a number of speakers and the moderator lets a prior speaker go over time. Since the program needs to end on time, all subsequent speakers need to cut their talks short. </p><p style="margin-top: 0; margin-bottom: 10px;">To manage this, when I’m a “later” speaker on a program, I plan ahead of time for parts which can be abbreviated. Do the least tasteful task first to get it out of the way! <p style="margin-top: 0; margin-bottom: 10px;">A judge asked me recently how long I would need for a post-trial brief. I responded, “No more than 48 hours.” When the judge told me that he was going to give me 30 days, I responded that I hated to write briefs, so if he gave me 30 days, I would ignore it for 28 days and do it in the last 48 hours, so we might as well just start with the 48 hours. </p><p style="margin-top: 0; margin-bottom: 10px;"><strong>How can an audience get the most out of a presentation? </strong> <br />Ask questions! It helps the speaker know what the audience thinks is important and the speaker can expand or clarify an issue. Do it! It’s fun, and you will learn more by preparing for the speech than any speech you have attended. <p style="margin-top: 0; margin-bottom: 7px;"><img src="http://images.wisbar.org/Images/DigestEmails/myProfile_250w.jpg" alt="" width="250" height="200" align="right"/>There is something to be said for the simple things in life. However, most of us can think of times in our lives when “less” did not turn out to be “more” – like when you asked for a raise, tried to hide that thinning hair with a comb over, or finished off a bag of your favorite potato chips. <p style="margin-top: 0; margin-bottom: 7px;">Join us September 27, 2017 for this popular event in northern Wisconsin offering informative CLE, networking, entertainment, and relaxation all in one place at Legendary Waters Resort and Casino in Red Cliff, Wisconsin. Municipal and Local Government, Civil Rights, Environmental, Public Interest, and Tribal Court Judges and attorneys are encouraged to attend. 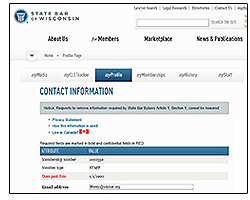 <p style="margin-top: 0; margin-bottom: 7px;">Compiled from several of the State Bar’s bestselling titles, these online libraries put the forms you need at your fingertips from wherever you have an internet connection*. Every document is fully customizable and regularly updated to ensure it complies with statutory specifications. Its easily searchable setup helps you find the form you need fast. <ul style="margin-top: 0; margin-bottom: 7px;"><li>The Delta Dental Premier network includes more than 90% of Wisconsin's dentists and 81% of all dentists nationally. These dentists offer members covered by the plans discounts on their services.